An old, worn-out bridge in a Virginia city was badly in need of replacement, but tearing it down and constructing a new bridge could create long-lasting sewage problems that would be far more serious than anything caused by a faulty bridge. The bridge would need to be replaced while preserving the integrity of the existing sewage system, through which seven local pump stations flowed. The close proximity of the sewage system to the area where new construction would occur made the job difficult. 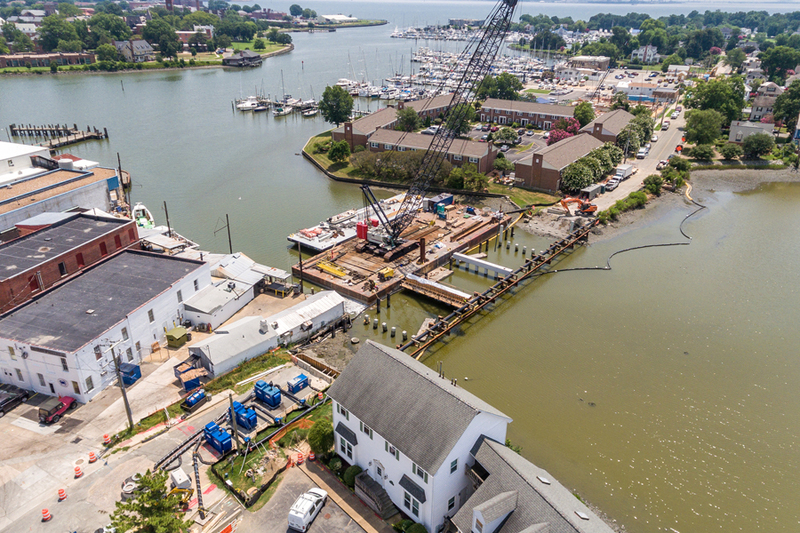 City officials were afraid that the vibration caused by driving the new bridge pillars into the ground would create fractures in the underground pipes, leading to the spilling of catastrophic amounts of sewage at the jobsite. Thompson Pump was contacted by subcontractor Shaw Construction to install the new utility work for the project, which included bypassing the existing gravity sewer during bridge construction and rehabilitation of the two existing gravity siphon chambers. Thompson Pump was chosen because of its expertise in bypass work and its long-standing relationship with the contracting firm. The contractor decided to use three Thompson 12-in. oil-less vacuum-assisted pumps and 18-in. high-density polyethylene pipe to bypass sewage from a manhole in front of the old bridge to a manhole on the other side of it—a distance of about 550 ft. These calculations were based on wastewater flow data provided to Shaw Construction and Thompson Pump during their initial meeting with the city’s sewage authority. Thompson Pump fused the pipe and strung it across the bridge using a crane. Once in place, the bypass was activated, allowing construction of the new bridge to commence in summer 2018 after months of planning. From the very beginning, Thompson Pump Sales Engineer Steve Lyon’s flowmeter gave him real-time water flow readings, and it did not take long to realize that the flow was significantly higher than anticipated. There were a several reasons why this occurred. The area received above-average amount of rainfall that allowed groundwater and storm water to enter the collection systems (inflow and infiltration). New buildings had been constructed in the area, including an addition to the Veterans Health Administration hospital and several residential communities. Tidal fluctuations also added to the ever-changing flows. All told, what was expected to be about 14 million gal per day (mgd) turned out, in reality, to be 19 mgd. Thanks in large part to the Thompson Pump bypass system and its reliable performance, the construction proceeded as planned without interruption. Once finished, Thompson’s temporary bypass was removed and it was “business as usual” when the new bridge opened.